1859 Mourning envelope to Hull franked by two 1d Rose-Red, SG 40, tied by York 930 duplex showing on the reverse flap a SUPERB FLAXTON-STATION UNDATED CIRCLE. VERY SCARCE, one of three known. 1865 Envelope to France franked by Four 1d Rose-Red, SG 43, Plate 74, tied by very fine WEYBRIDGE STATION "B87" numeral cancellations and showing a Weybridge Station circular datestamp on the reverse. ATTRACTIVE AND SCARCE. Circa 1905 Postcard to Plympton franked by a ½d Yellowish-Green, SG 218, tied by a very fine LIVERPOOL.STA/LATE BOX hooded circular datestamp; no Late Fee applied as only used for foreign mail - the charge ½d. VERY SCARCE. 1913 ½d Green, SG 344, tied to Postcard to Edinburgh by a VERY FINE 'BLAIR.ADAM STATION/65' double rim circular datestamp - Latest ?Recorded Date. 1920 RAILWAY STATION - Certificate of Posting cancelled by a very fine STATION R.O./DOUGLAS circular datestamp. VERY SCARCE. 1780 Entire from HANOVER, JAMAICA to London CARRIED "BY COMMADOR OF THE JAMAICA FLEET" showing a fine PORTSMOUTH/SHIP.LRE, Robs S1, enclosing a Bill of Exchange from Hanover, Jamaica. 1903 Registered envelope from Niue to Sheffield, England, franked by a Perf 11 2½d (2), Perf 14 ½d (2) and 1d (2), tied by Violet NIUE datestamps. Backstamped at Apia. 1820 Cover from the BRITISH VIRGIN ISLANDS addressed to London showing on the front a SUPERB two-line "TORTOLA/8JUL20" handstamp, Type 3A with two numerals for year date. 1811 Entire from Macksfield Park, Jamaica, addressed to Hythe, Kent, sent "Pr HMS NAIAD" showing a poor oval SHIP LRE/♔/JAMAICA and a fine SHIP-LETTER/♔/PORTSMOUTH, Robs S10. 1859 1d Rose-Red, SG 40, STRIP OF FOUR, I-E/I-H, tied to entire addressed to Genoa, Italy, by VERY FINE MALTA 'A25' DUPLEX, showing a three-line "PIROSCAFI/POSTALI/FRANCESI" in Red and manuscript "1¼" accountancy together with an oval 'P-D.' in Black, "PAY A DESTINATION". 1902 Transvaal Field Post 1d Pink Stationery envelope to Switzerland franked by two 1d Lilac, SG 172, tied by very fine 'ARMY POST OFFICE/WONDERFONTON" circular datestamps and showing a PRETORIA CENSUS CACHET. 1945 Envelope from Tokyo Bay, Japan dated 2nd Sept. 1945, addressed to Australia with, on the front in Red, H.M.A.S. "SHROPSHIRE"/Official Signing Of/Japanese Surrender; also on the front is a "PASSED BY CENSOR" mark in Blue complete with interesting social letter. 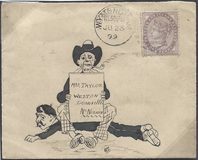 1880 6d DEEP GREY, SG 146, PLATE 16, tied to neat envelope addressed to CAPT. CUNNINGHAME, "SHIP BERKSHIRE", POST OFFICE, MAURITIUS, by a very fine Haddington 171 duplex. 1876 Envelope to Pontypridd franked by a 1d Rose-Red, SG 43m, tied by a HANDSTRUCK '1' AND PART OF AN ABERDARE DUPLEX. Very Unusual. 1791 Entire from Wales to London showing on the reverse a straight line CARDIGAN, W561, and on the front a LONDON 'PAID' DATESTAMP, L92a. VERY SCARCE. An attractive combination. 1856 2d BLUE, SG 34, PLATE 5, PAIR, H-G/H-H, tied to neat envelope to Paris by very fine TYPE II 'CARDIFF' SIDEWAYS DUPLEX and showing 'INSUFFICIENTLY/STAMPED' and manuscript '16' Decimes due charge. VERY ATTRACTIVE. 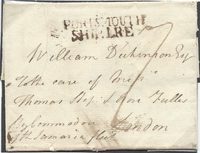 MAY 27TH 1840 1D MULREADY ENVELOPE, Forme 2, Stereo A145, addressed to Shrewsbury and cancelled by a fine CHIRK MALTESE CROSS IN RED. A SCARCE WELSH MAY DATE USAGE. 1844 1d Red-Brown, SG 8m, lettered S-G. A superb four-margin example tied to entire to Brighton by a SUPERB NO 10 IN MALTESE CROSS - SUPERB AND VERY SCARCE. Cat £1,000 on cover. 1794 Entire to a solicitor in Yorkshire which included "...my direction is this - William Norman soldier in the Duke of Argyll's Company 3rd Regt of Foot Guards on Foreign Service..." It must be post paid as usual in London, charged 1/6 plus 1d Ship Letter fee, showing a VERY FINE LONDON/SHIP.LRE, Robs S5, in Black. 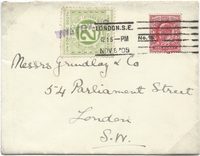 1930 Registered 'Express' stationery envelope to Austria cancelled by VICTORIA STATION circular datestamps. 1886 2½d LILAC, SG 190, BLOCK OF FOUR tied to envelope addressed to Paris by very fine London 104 duplex. 1883 Registered envelope from Paris to London showing a SUPERB 25 mm OVAL-FRAMED "REGISTERED/F.N.M./18 JY 83/LONDON" in Black. FOREIGN NIGHT MAIL, W501. RARE. 1910 Postcard from Sandbank to London showing a fine "POSTED ON BOARD S. S. FAIRY QUEEN/LOCK ECK/ARGYLLSHIRE" cachet in Violet. 1908 Postcard to Hastings cancelled by a "GLASGOW & SOUTH-WESTERN/STEAM VESSELS/P. S./3 JUL 1908/JUNO" cachet in Violet, together with a picture postcard of the Steamer. SCARCE. 1816 Entire addressed to London and redirected to Ramnsgate showing a very fine straight line ROBERTSBRIDGE, SX1010, and a fine boxed "POSTAGE TO LONDON/NOT PAID". Ex Jay. 25th DEC 1839 CHRISTMAS DATE Entire addressed to Aberystwyth showing on the front a London Uniform MS 4 in Black. 1826 Entire addressed to Ludlow, Salop, with, on the front, a double-framed 'PUT IN AFTER/7oCLOCK AT NIGHT', L286. 1840 1d Mulready Envelope, Forme 3, Stereo A160, addressed to Oxford and cancelled by a SUPERB CREWKERNE MALTESE CROSS IN RED and showing a VERY FINE HASELBURY/PENNY POST on the reverse. 1857 6d Lilac, SG 70, 2d Blue, SG 19, Plate 4, and 1d Rose-Red, SG 40, tied to envelope to India "Via Marseilles" by a very fine Type II CHELTENHAM Sideways duplex. An attractive triple combination. 1910 R.M.S. "Caronia" Postcard sent "Pr S. S. Lusitania" to Guernsey franked by a ½d, SG 217, tied by a very fine PAQUEBOT/POSTED AT SEA/RECEIVED/date & time/CARDIFF cds, Code B, Robs P1. 1853 2d DEEP BLUE POSTAL STATIONERY ENVELOPE addressed to THE EARL SPENCER, LONDON, CANCELLED BY A YARMOUTH, NORFOLK '927' NUMERAL. SCARCE. 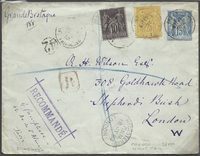 1869 2/- DULL BLUE, SG 118, PLATE 1, D-B tied to entire addressed to Peru "via St Nazaire - P French Mail" tied by a fine London '71' duplex and showing a British Post Office PANAMA transit cds. A FINE DESTINATION. 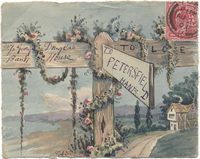 1903 A beautfiul Hand Illustrated Front from York to Petersfield, Hants. 1820 Entire from Kilkenny to Congleton posted on a Sunday showing a SUPERB DOUBLE OVAL 'SUNDAY/21 MY 21/1820' DATESTAMP in Red of Dublin. Charged '8' and changed to '1/8' Unpaid. 1864 LATE USE OF 2d MULREADY LETTER SHEET. A fine example addressed to Devizes cancelled by a VERY FINE SALISBURY 683 NUMERAL CANCELLATION - A SCARCE LATE USAGE. Cat £2400. 1830 Entire from London addressed to Mt Harboro, Leicestershire, showing a London MORE/TO/PAY in Red, L253. On the reverse there is a framed 'Smithfield/Bars" in Black. 1857-58 2d Blues, SG 35 snd 36A, PERF 14 AND 16 LARGE CROWN FROM PLATE 6. MATCHED PAIR LETTERED A-K, showing Constant Variety Spec F7h and F8c. Very Fine Used. Cat £580. 1854 2d Blue, SG 19, Plate 4, Small Crown Perf 16, C-E RE-ENTRY, Spec F1f. Very Fine Used. Cat £200. 1855 2d Blue, SG 23A, Plate 5, lettered K-I. VERY FINE USED! 1855 2d Blue, SG 23A, Plate 5, Small Crown, Perf 14, lettered S-C/S-D. A VERY FINE USED PAIR. 1841 1d Red-Brown, SG 7, PLATE 2, lettered G-H. VERY FINE USED with four good, even margins. 1852 1d Red-Brown, SG 8, ALP II LETTERED I-L. A Very Fine used four-margin example and showing PART INSCRIPTION AT RIGHT. 1841 1d Red-Brown, SG 7, PLATE 5, Lettered J-C. SUPERB USED with four margins. 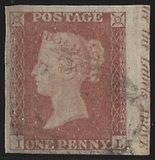 1867 10d RED-BROWN, SG 112, Plate 1. A BRILLIANT TOP RIGHT-HAND CORNER MINT PLATE BLOCK OF TWELVE OVERPRINTED 'SPECIMEN', TYPE 9, SPEC J97s, ELEVEN STAMPS UNMOUNTED. A RARE EXHIBITION PIECE. 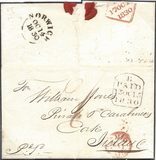 1859 Envelope addressed to Dublin, franked by a 1d Rose-Red, SG 40, tied by a fine BALLINASLOE IRISH-TYPE SPOON CANCELLATION. 1825 Entire from Richard Stevens addressed to "Capt. Nicholas Le Cheminant/De Lisle Janvrin, & De Lisle/Devonshire Square/London" showing a SUPERB "FROM GUERNSEY", MS 1/1 - 10d Inland + 3d Packet. 1857 Envelope addressed to Dublin franked by a 1d Red-Brown, SG 29, and cancelled by a superb Belfast Irish Type A Spoon cancellation, Code M.
1929 PUC £1 BLACK, SG 438. A SUPERB USED CORNER BLOCK OF FOUR. 1913 Postcard from Southport to Ireland, franked by a ½d Green, SG 344, showing a boxed "TOO LATE/SHIP SAILED" cachet in Violet. 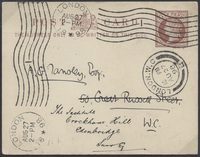 1910 Envelope to Middlesex franked by a 1d Scarlet, SG 219, tied by a superb PAQUEBOT/POSTED AT SEA/LIVERPOOL, Robs P34. 1859 Entire addressed to Worcestershire with, on the front, a Grand Northern Railway 'E/NR' in circle, W10. 1772 Entire from Douglas, IOM, to Shropshire showing a superb first-type ISLE OF MAN, IM1, IN BLACK, 56 x 7.5 mm, MS "2" AND "6" ERASED, and corrected to "In All10", W1. RARE. 1808 Entire from Dublin to London showing a superb STRAIGHT LINE IRELAND, 68 x 12 mm, in mixed red/black, L225a. 1906 Postcard addressed to Allonby, Yorkshire, from Holyhead, showing a fine BRISTOL-SHREWSBURY & YORK T.P.O./FROM.WEST cds, * Code, W116. Scarce. 1862 MAIL BOAT CANCELLATION. Envelope posted on board the Cunard Line Boat NIAGARA which sailed from New York, called in at Boston en route to Queenstown, Ireland, where it arrived on 27th April 1862, arriving in Brighton, Sussex, two days later on 29th April 1862. Franked by a 6d Lilac, SG70, TIED BY A VERY FINE 'A98' MAILBOAT cancellation. RARE! 1825 Entire addressed to "Ship St", Brighton showing on the front a fine Brighton Penny Post. 1870 Entire to Hamburg franked by a 6d Mauve, SG 109, Plate 8 x Two, a 4d Vermilion, SG 94 and 1d Rose-Red, SG 43, all tied by 'C51' NUMERALS OF ST THOMAS WITH 'ST THOMAS-PAID CDS, alongside carried "Pr Shannon" via London to Germany. VERY ATTRACTIVE. 1855 2d BLUE, SG 27, PLATE 5, L-H. A fine example tied to envelope from Guernsey addressed to Shrewsbury - A VERY SCARCE STAMP ON COVER. Cat £575 on cover. 1905 London and South Western Railway 2d Green cancelled by a STRAIGHT LINE 'SWAYTHLING' (suburb of Southampton) in Violet, addressed to London. 1815 Entire from Dublin addressed to Larne showing boxed Dublin 'PAID' datestamp and a VERY FINE OVAL '♔/REVENUE/PAID', both marks in Red. VERY SCARCE. 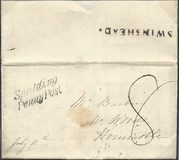 1856 Entire to Boston, USA, franked by a LARGE MARGIN VERTICAL PAIR OF THE EMBOSSED 1/- GREEN, SG 54, DIE 'WW2' AND A 2d, SG 34, plus 1d, SG 29, TIED BY LIVERPOOL '466' NUMERALS. VERY ATTRACTIVE. 1864-79 1d Rose-Red, SG 43, PLATE 87. An attractive mint, lower right-hand corner PLATE BLOCK OF 24. Cat £1150 as single stamps. 1813 Printed cover adddressed to Norwich with, on the front, a very fine RYE/63 mileage mark. 1883 LATE FEE 1d Pink Stationery envelope to Thuringen franked by a 1d Lilac, SG 172 and ½d Green, SG 165, tied by superb London Hooded Circle datestamps - the 1d Lilac is also cancelled by a LATE FEE "L" IN RED, UNUSUAL. PAREMENTER LISTS AS "RARE". 1883 ½d DEEP GREEN, SG 164 and a BISECTED 1d LILAC, SG 172, tied to envelope from London E.C. to Enfield - ½d plus Bisected 1d making up the 1d Rate. 1840 1d GREYISH BLACK, SG 3, PLATE XI, LETTERED E-E. A very fine three-margin example cancelled by a fine RED MALTESE CROSS, SPEC AS72e. V E R Y R A R E - SG Cat priced at £40,000 - matched with 1841 1d Red-Brown, SG 7, Plate XI, E-E. RPS CERTIFICATE. 1905 Postcard to Douglas, Isle of Man, cancelled by a ½d, SG 218, tied by a VERY FINE MANCHESTER/ADVANCED POSTED/CHRISTMAS 1905 RUBBER PARCEL'S CACHET IN VIOLET. RARE. 1842 1d Pink Stationery envelope addressed to Exeter cancelled by a VERY FINE LYME (WESSEX TYPE) CIRCULAR DATESTAMP. Attractive. 1873 Entire addressed to Paris franked by a BLOCK OF FOUR 1½d ROSE-RED, SG 51, PLATE 1, tied by very fine Exchange/Liverpool '466' duplex. A VERY SCARCE BLOCK OF FOUR ON ENTIRE, two stamps affected by a light horizontal crease. Attractive and Cat £750 off cover. 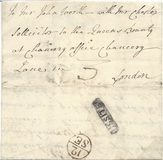 1821 Entire addressed to London with, on the front, a very fine HORSHAM/36 mileage, SX673. 1857 REGISTERED ENVELOPE TO BAKEWELL franked by a 1d Red-Brown, SG 29, and a 6d LILAC ON AZURE PAPER, SG 70A, tied by very fine London '24' numerals. Very Attractive but stamps with filing crease although this is barley noticeable. SG 70A Cat £925 off cover. 1822 Missionary Entire from Miramichi (New Brunswick) addressed to London showing a SUPERB SUNDERLAND/SHIP LETTER, Robs S1. VERY FEW KNOWN - RARE. 1840 MAY 9TH FRAMED 'PAID/〰at〰/DUNGANNON' USED DURING THE UNIFORM PENNY POST PERIOD. 1898 BOSTON FIRST-TYPE MACHINE TRIAL CANCELLATION struck twice on a superb ½d Brown Postcard to London, redirected to Edenbridge. In use for 36 days in Aug-Sept 1898. RARE. 1889 1d Lilac tied to envelope to Langholm by a very fine Type X Dubus Hoster Machine cancellation. 1872 THIRD TRIAL AZEMAR EXPERIMENTAL MACHINE CANCELLATION, 1d Rose-Red, SG 43, Pl 140, tied to Entire to Liverpool, Code 'AB'. Ex Tony Potter. 1816 FREE cover used locally in Dublin franked by the Joint Postmaster General of Ireland, Charles Henry St. John O'Neill, showing a fine CROWN OVAL 'TO . BE/DELIVERED/FREE in black. On the reverse is a fine 'P.P. OFFICE/8 NO 8/19/6 O'CLOCK EVG' time stamp. 1858 1d RTose-Red, SG 40, tierd to cover addressed to Huntingdon by a very fine PEARSON HILL MACHINE CANCELLATION, CODE 'M', PHT 2. A VERY RARE TRIAL CANCELLATION CODE 'M'. Ex T Potter. Circa 1885 ½d Brown Stationery piece cancelled by a superb impression of the London NPB Hoster cancellation, Coide ZZ. 1869 FIRST-TYPE AZEMAR EXPERIMENTAL MACHINE CANCELLATION cancelling a 1d Pink envelope addressed to Haverfordwest - SCARCE cancelling 1d Pink. Superb. 1840 MAY 13TH 1d MULREADY LETTER SHEET, STEREO A2, FORME 1. Very fine used, addressed to Wigan and cancelled by a SUPERB WARRINGTON MALTESE CROSS IN RED - A Scarce early May date. Some Creasing. Cat £1200. 1851 Envelope from Gronigen, Netherlands addressed to Chorley, Lancs and showing a SUPERB FRAMED HARWICH/SHIP LETTER in BLUE - THIS IS THE ONLY EXAMPLE RECORDED FROM THE 19TH CENTURY, the previously recorded dates being1913? - 1922, Robs S5. It is also the ONLY RECORDED EXAMPLE IN BLUE- not mentioned by Robertson or Tabeart. Circa 1770 Cover addressed to London with on the reverse a fine straight line KEINTON with Bars Above and Below, WA182. Scarce. 1859 Envelope from London addressed to Basingstoke cancelled by a 1d Rose-Red, SG 40, tied by a superb Charles Rideout No 2 Machine Cancellation, Code 'CR'. 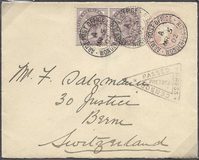 1886 Entire from London addressed to Trieste franked by a 2½d Lilac, SG 190, tied by a very fine ETHRIDGE EXPERIMENTAL MACHINE CANCELLATION. Very Scarce. 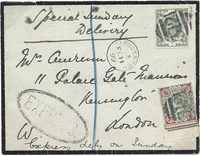 1887 Entire from London addressed to Cognac (France) cancelled by a 2½d Purple/Blue, SG 201, and tied by a very fine London Hoster Machine cancellation. 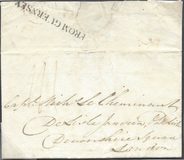 1829 Cover from Denmark to London showing on the reverse a very fine step-framed SHIP LETTER/HARWICH, Robs S3. 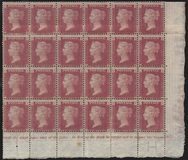 1887 5d Dull Purple & Bright Blue, SG 207A, Spec K36(2). A very lightly mounted mint block of four - two unmounted mint. 1877 4d Sage-Green, SG 153, Plate 15, overprinted 'SPECIMEN', Type 9, Spec J64s. A Superb Very Lightly Mounted Mint example. 1876 6d Grey, SG 147, Plate 15, L-E. A Superb Mounted Mint example. 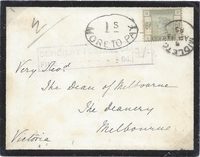 1884 4d Dull Greeen, SG 192, lettered P-A. Perforated 12 and overprinted 'SPECIMEN', Type 9, Spec K22t. Cat £600. A fine unused example. 1880 1½d Venetian Red, SG 167, overprinted 'SPECIMEN', Type 9, Spec K4s. A superb, lightly mounted mint block of four, two unmounted mint. 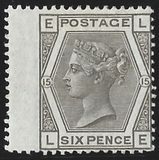 1882 6d Grey, SG 161, Plate 18, lettered P-J. Very fine Mounted Mint. 1881 1d Lilac PLATE PROOF, SG 172. A VERY FINE MINT PLATE PROOF IN LILAC ON GREEN. Cat £225. 1879 TENDER ESSAYS. A very fine Mint strip of Six in Rose Pink by Berkins Bacon Ridgeway. There is a vertical fold between Rows 3 and 4. 1879 TENDER ESSAYS by Perkins Bacon & Co in THREE colours, Claret, Black and Grey. Three very fine mint imperforate examples. 1879 TENDER ESSAYS by Perkins Bacon in Orange - a Mounted Mint imperforate strip of SIX. 1827 Entire from Jersey addressed to Cognac with, on the front, a very fine "GRANDE BRETAGNE/PAR ST. MALO", CF11, and showing a postage due of 11 décimes - 6 déc entry charge + 5 déc St Malo-Cognac. Ex Barry Jay. 1794 Cover to Bromley, Kent, showing a very fine CONCAVE GUERNSEY, first year of use, GC1, 46 mm. Small tear on front panel. 1855 4d CARMINE, SG 62, TIED TO ENVELOPE FROM LONDON TO PARIS - the accepting Post Office omitted to cancel the stamp and later on, during transmission, the Post Office applied the Red 'PD' (Paid to Destination) as a canceller. VERY ATTRACTIVE. RPS Certificate. 1692 Entire from London to Mannington, Norfolk, sent "BY AYSHAM BAG" and showing a superb 'IV/18 London Bishop mark. Letter mentions "The discourse this day is that the siege of Namur is raised but is certain the Fourth have lost a great number of men and are weary of Siege". 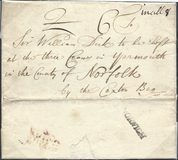 1752 Cover addressed to Norwich. On the reverse is a two-line SWAFF/HAM, N 384. VERY FINE. Sent "By Thetford Bag". 1935 Registered envelope addressed to Bournemouth showing a SHOWGROUND/PETERBOROUGH SKELETON DATESTAMP, SECOND YEAR together with a Registered Peterborough No 11 label with manuscript "SHOWGROUND" inserted. VERY SCARCE. 1796 Entire to Kimbolton showing a fine two-line WANDES/FORD, NN 247, 36 x 12 mm. VERY SCARCE - RATED 'H' in County Catalogue. 1840 Entire addressed to London showing on the front a very fine Northampton Handstruck '2' Postage Due in black. 1858 1d Pink stationery envelope addresssed to Market Harborough cancelled by a very fine original Northampton Spoon duplex. SUPERB. 1840 Cover addressed to London showing a three line Peter-/-borough/Penny Post in Red and Crowland No 3 Receiver in Black. 1797 Entire from a widow enquiring after a Widow's Pension and mentioning that her father was killed at 'Bunker Hill' and brother was killed (died) at Botany Bay, addressed to London showing a fine two-line convex PETER/BOROUGH, NN 184. Transcript enclosed. 1857 Envelope to London franked by a 1d, SG 40, tied by a Type II Nottingham Sideways duplex and with a SNEITON undated circle on the reverse; showing a very fine NOTTINGHAM HANDSTRUCK '2' POSTAGE DUE and London MORE/TO/PAY, RL 'C'. 1833 Entire from Bristol to Alveston, mis-sorted to Taunton showing a very fine MISSENT*to*TAUNTON and manuscript "Suppose Alveston Bristol". 1796 Entire addressed to Bewdley, Worcestershire, showing a STRAIGHT LINE NEWPORT, 28 x 4 mm, RE-USE OF FIRST-TYPE, SH 358. Very fine. 1874 Envelope addressed to Canada franked by a 3d Rose, SG 143, Plate 14, S-K, tied by a SUPERB PORTADOWN '375' DUPLEX; also cancelled by a SUPERB HANDSTRUCK '1d' and '2' INDICATING POSTAGE DUE. A VERY ATTRACTIVE IRISH USAGE. 1835 Entire from Amsterdam to London endcorsed "FRANCO TOT DE STOOMBOOT" showing a very fine 'SHIP LETTER/♔/DATE/LONDON' in Black, Robs S22. Ex Robertson and Forrestier Smith. 1911 ½d GREEN, DIE 1A, ERROR PERFORATION 14, SG 322A, tied to postcard to Norwich by a SUPERB 'CAISTER . ON . SEA' circular datestamp - ONE OF THE 7 EXAMPLES KNOWN USED IN CAISTER. SUPERB! 1842 Entire from Antwerp to London showing a very fine 'SHIP LETTER/♔/DATE/LONDON' in Red, Robs S28. 1840 Local prepaid cover to Richmond Hill from the Strand showing two hexagonal London datestamps, one being the incorrect date and deleted by the use of a VERY FINE RED MALTESE CROSS - UNUSUAL USAGE. 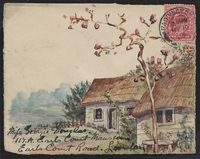 1825 Cover from Quebec addressed to "Bible Society's House, London" and showing a superb step-framed HYTHE/SHIP LETTER, Robs S3. VERY SCARCE. 1881 County Courts envelope to Church Gresley franked by a strip of three 1d Venetian Red, SG 166, tied by very fine BIRMINGHAM '75' NUMERALS IN BLUE. A VERY ATTRACTIVE REGISTERED ENVELOPE. 1786 Entire to Craven Street, Strand, showing a fine Type 4 GENERAL OFFICE DOCKWRA for 'PENNY/POST/PAID/G/FR', L 336. 1867 2d Blue Pair, SG 45, Plate 9 and 1d Rose-Red, SG 43, Plate 104, tied to small envelope to Switzerland by FRENCH '1769' NUMERALS IN LOZENGE OF DOTS. Posted in a moveable box on ship from Southampton to Le Havre and on to Switzerland. SUPERB and VERY ATTRACTIVE. 1887 2d Registered envelope from LEWES-RD/BRIGHTON addressed to TASMANIA franked on the front by three 1d Lilac, SG 172 and showing a very fine "REGISTERED/BRIGHTON STATION OFFICE" oval datestamp. 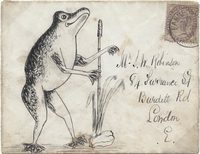 On the reverse it is FRANKED BY A FURTHER NINE 1d LILAC, SG 172. 1791 Entire headed "MONTREUIL" giving details of a Sugar Estate in St Patrick Parish addressed to Glasgow "By Packet" showing a SUPERB "GRENADA/♔/+" circular-framed handstamp, MS 1/- and 1/10. SUPERB!!! 1804 Cover to London showing an oval . SHIP LRE ./♔/GRAVESEND, Robs S2. MS 1/4 cancelled by an Inspector's Crown and uplifted to 2/- Triple Rate. 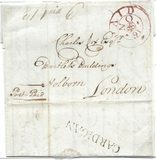 1830 Cover to London showing a very fine STRAIGHT LINE SCILLY on the reverse, MS 3/-, cancelled by an Inspector's crown uplifted to 4/-. 1906 3d Purple on Lemon, SG 234, SHOWING BROKEN 'SCROLL' VARIETY, Spec M20(5)b. Very Fine Used on Piece. Cat £250 mint. 1912 9d Slate Purple & Cobalt Blue, SG 308, Spec M4(4)F. A very fine used Block of Four. SCARCE! Cat £440 as Singles. 1865-68 PRE-CANCELS. 1865 'S' for Smith Elder & Co by special arrangement with the Post Office; from 1868, they were taken over by Henry King & Co with 'K' in circle. An attractive group. 1934 10/- Indigo, SG 452. A very fine used Block of 4. 1844 1d Red-Brown, SG 8p, with 1844 cancellation in GREEN. A fine four-margin example. Cat £3000. 1869 6d Mauve, SG 109, Plate 9, lettered R-J. A fine, imperforate example, overprinted SPECIMEN, Type 6, Spec J77s. Cat £450. 1867 10d Pale Red Brown, SG 113, Plate 1. 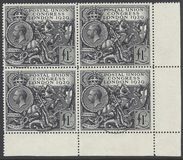 A very fine used block of four with SEETHING LANE circular datestamps. A scarce and attractive block. 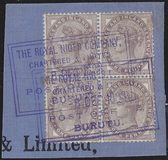 1898 1d Lilac, SG Z57, Block of 4, tied to piece by BURUTU [Niger Coast] cachets in Violet. 1898 5d Dull Purple & Blue, SG Z36, x 7, tied to piece by AKASSA [Niger Coast] cachets in Violet. Scarce. 1867 10d Deep Red-Brown, SG 114, Plate 1, lettered F-G. Superb used with MALTA cds. 1872 4d Vermilion, SG 94, Plate 13, lettered A-H. Very fine used with ST. THOMAS/PAID cds. 1900 GOVT. PARCELS 1/- Green & Carmine, SG O72. Fine mounted mint. Cat £650. 1851 Entire from GREAT YARMOUTH to Acle showing a very fine SOUTH/RECEIVING HOUSE of Yarmouth, NK 521d. RARE. 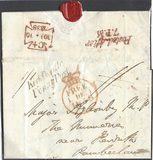 1840 1d Mulready envelope addressed to Ireland and cancelled by a SUPERB NORWICH MALTESE ✠ IN RED. 1844 June 10th 1d Mulready Letter Sheet addressed to Deptford containing the 'Economic Life Assurance' advertisement, Spec MA 115a, and cancelled by a VERY FINE YARMOUTH '927' NUMERAL. A Very Scarse Late Usage. 1795 Entire addressed to Moffats, Hertfordshire (a preparatory school started in the 16th cerntury?) with, on the front, a very fine 'RICHMD/-2- Receiving Office mark in black. 1798 FREE entire to Edinburgh showing on the reverse a SUPERB SQUARE-FRAMED LONDON 'LATE FEE' datestamp in Black. VERY SCARCE, L 36. 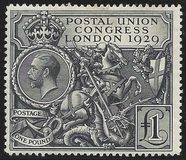 1929 PUC £1 Black, SG 438. A fresh, mounted mint example with Light Toning. 1864-79 1d Rose-Red, SG 43, Plate 171. A FRESH, MINT TOP MARGINAL BLOCK OF TWELVE. 1879 Tender Essays by Perkins Bacon in Rose. A vertical strip of Five, very fine mounted mint.